Goalwin Poker is a part of the Ongame Poker Network, which means that you play against players from Betsafe Poker, Betsson Poker, CasinoEuro, HeyPoker, FullDeckPoker, RedBet Poker, RedKings, and more. Goalwin has a gambling license from Gibraltar. Goalwin Poker is a part of the Ongame Network. This network is owned by Amaya Gaming and blocks players from the United States. The poker software was developed by Bwin Interactive Entertainment and is definitely top-notch. A lot of statistical info is readily available for each individual table, such as average pot size and hands played per hour. This makes it easier to find a table that suits your preferences. Multi-tabling is not a problem. 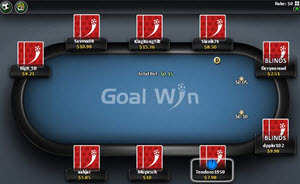 You can have up to 16 tables active simultaneously at Goalwin Poker. Since players from U.S. are blocked, a majority of the players in the network are European. This means that peak traffic for this network is during peak-European time. You can accept up to $1,500 in bonus money when you make your firs deposit to Goalwin Poker, even if your first deposit is smaller than $1,500. Use the code SPECIALBONUS. The bonus is released in $50 increments. Point races are very common at Goalwin Poker. During the most generous months, the combined prize pool exceeds $12,000. There is a loyalty scheme for poker players and this is the key to the 4-tier VIP Club. Claim from 12% to 40% cash back, depending on your level. The poker support is staffed 24/7 every day of the week. The email address is info@goalwin.net. There is also an extensive FAQ section available on the site. Examples of transaction methods accepted by Goalwin are VISA, MasterCard, Skrill, Neteller, Click2Pay, and PaySafeCard.